Check out this cover of Entertainment Weekly, with the actors who are playing Gale and Peeta in the Hunger Games movie, which is scheduled to release in March. As I only sort of follow all of the movie news, this was the first time I had seen the actors. They aren't exactly what I pictured in my head, but that's all right--they're going to represent the characters well, I think. Hot hot hot, I'm excited. 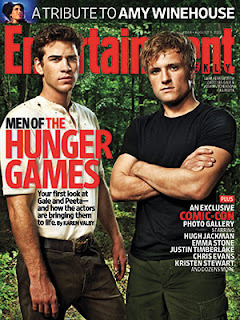 That is EXACTLY how I imagined Peeta! I think this is the first time I've ever seen a character that fit my mental image of them so well. I never got a solid image of Gale, but this fits what little I could see. I guess Collins did a better job describing them than I realized.